Last week I posted a review of BS Brand Beef Jerky - Original, and now have this jalapeno variety to follow up with. BS Brand is a small manufacturer based out of Midland, TX. It was started by a guy named Billy Stewart, who started out making jerky for himself and his friends. In addition to this jalapeno and original varieties, BS Brand also offers Tex Mex, and Barbecue varieties. Stewart makes this jerky out of his own USDA approved facility, where it's all hand made, hand cut, and where even the bags are filled by hand. With the original variety, I said that it had a good meat flavor, and a good contrast with the black pepper and garlic. But while I found it "good", it wasn't anything that excited me enough to warrant a "best" rating. Does this jalapeno variety have that extra bit of something to push it up to the top? Beef, water, salt, dextrose, sugar, sodium lactate, jalapeno peppers, spices, natural smoke flavor, monosodium glutamate, hydrolyzed soy protein, dehydrated onion and garlic, caramel powder, sodium nitrite. The flavors I pick up from the surface of these pieces is a jalapeno "aroma", and that's about it. In the chewing, I'm getting a meat flavor right away, and some jalapeno taste, and a light saltiness. If I were to chew a piece immediately after putting it into my mouth, I get the natural meat flavors, with a bit more salt, and about the same level of jalapeno flavor. As far as being a jalapeno variety, there's a lot of jalapeno to be seen on these pieces, not just in the yellow-colored seeds, but I can see a lot of blackish-green jalapeno chunks stuck to this meat. And, I do taste the natural flavors of the jalapeno well enough to notice. It tastes like real jalapeno chiles, roasted slightly, as opposed to jalapeno-flavored seasoning that some other jerky brands rely on. I do not, however, get much jalapeno hotness. That is, it's not hot by any means. I'd call this jerky mild, though I can detect a bit of spicy tingle in the back of my mouth. Maybe someone else might find it "mild-medium". But I'd consider the natural meat flavors to be the dominant flavor of this jerky. It's got a mellow, smooth flavor. Again, not a strong flavor, but light to moderate depending on the pieces. Like in the original variety, there are pieces darker in color which seem to have a more "well done" meat flavor, while the lighter colored ones are more smooth and mellow in taste. The jalapeno flavor perhaps provides the second-most dominant flavor of this jerky, though it could be a 50/50 split between the jalapeno flavor and the natural meat flavors, on those pieces with more than their fair share of jalapeno pieces. Interestingly, the level of salt intensity in this jalapeno variety seems much more light than the original variety. I'm not sure I can name the saltiness as having any kind of dominant flavor. And I don't really pick up the garlic aftertaste that I could in the original variety. These appear to be strips of whole meat, sliced to a medium thickness, and in lengths of about 1 to 4 inches. It's a dry jerky, on the brittle side, but still with a tad bit of flexibility. It's fairly easy to bite off, while the chewing seems to require a bit more effort. Some pieces are rather hard. The chewing texture has a meat-like quality to it. Once it hydrates in my mouth, it has a fibrous character that gives me a sense that I'm eating real meat. The more brittle pieces however, darker in color, tend to crumble apart and chew into tiny fragments and don't really hold together like meat. It's pretty clean eating, leaving no powder or residue on my fingers, and nothing falling on my lap or desk. I don't find any bits of fat on these pieces, nor do I find any chewy tendon or gristle. 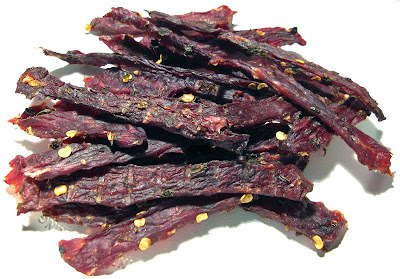 For general jerky snacking purposes, at $3.11 per ounce, it's a fair value. While I do get a great deal of snackability with its light-to-medium level of jalapeno flavor, it's smooth mellow meat flavor, and it's good chewing texture, that price makes buying this jerky rather prohibitive. I think you'll really snack on this jerky, but for that high of a price, it's not that awesome. As a jalapeno variety, also at $3.11 per ounce, it's a fair value as well. I do get a good deal of lightly roasted jalapeno flavor. I can taste the unique flavor of the jalapeno chile all over these pieces. But I don't get much spicy burn, probably none at all. There's nothing extraordinary about this jalapeno flavor to make me want to pay the $3.11 per ounce over and over again. Perhaps what sets this jalapeno variety apart from many others is that it offers a noticeable degree of lightly roasted, natural jalapeno flavor, and not just a jalapeno seasoning salt. In some pieces it's just a light flavor, but in others you'll get lots. If you want to enjoy a simple jalapeno beef jerky, you'll get exactly that with a mellow smooth natural meat flavor mixed in. You will not, however, get much spicy burn from this. As far as my palate is concerned, none at all. 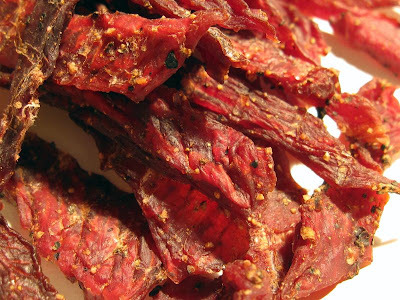 But add to that a light saltiness, and a decent-to-good chewing texture, it makes for what I think is a better than average jerky. I didn't award it a best rating because I just didn't feel there was anything in here that was out of this world. While it does provide a great tasting jalapeno flavor, that's largely what I would expect to get anyways from a jalapeno jerky. I'd certainly recommend this jerky to anyone wanting a jalapeno flavored jerky, provided they're willing to pay the very high $3.11 per ounce price. I'd go with a very light tasting cream ale or honey blonde ale to pair this up with.